This is a modified version of a recipe that a former roommate shared with me a few years ago. The original recipe was good, but a little too plain. Last year I made changes to it and presented different versions of the recipe (including a white chocolate version and a peanut-butter chocolate version) to a group at a cookie exchange party. 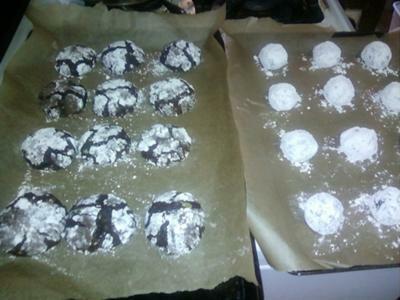 The Mint Chocolate version was the most liked, and I've been tweaking all of the recipes bit-by-bit. So far the Mint Chocolate version is still my favorite. *I find that dark cocoa helps to balance the mint and also keeps it from becoming too sweet with the powdered sugar coating. If you prefer a sweeter cookie with a stronger mint flavor, use Dutch-processed cocoa instead. **I prefer the Andes mints (if you can find them, they do also have them in chips form in the baking aisle). I have used mint chips before, and I've found that Andes mints melt much better and have a nicer consistency. STEP 1: Melt baker's chocolate and butter in a double boiler. Stir often until everything is melted. Set aside and allow it to cool while you prepare the rest of the ingredients. STEP 2: Combine flour, cocoa powder, baking powder and salt. Set aside. STEP 3: Beat together eggs, granulated sugar and vanilla. Keep beating until light in color and thick. Use a wooden spoon to stir in melted chocolate until well blended. STEP 4: Slowly mix in the dry ingredients. Beat until incorporated. STEP 5: Stir in chocolate chips. STEP 6: Cover bowl with plastic wrap and refrigerate for at least one hour until dough is firm enough to roll into balls. 1. Preheat oven to 325F (160C) degrees (middle rack in oven). Line baking sheets with parchment paper. 2. Put confectioner's sugar into a shallow bowl and rub some on your hands (I find that this helps keep the dough from sticking to your fingers while rolling). 3. 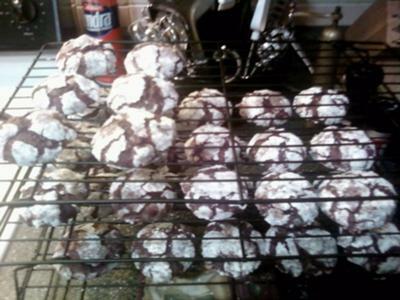 Roll dough into balls, and then lightly roll each ball in powdered sugar before placing onto cookie sheet about 1 inch apart. Let cool on baking sheet for 5 minutes before transferring to wire racks. Follow 2 and 3 above. Place cookie sheet in freezer until cookies are solid. Transfer cookies into plastic freezer bags for storage. When ready to bake, put them onto parchment-lined cookie sheet. Let them thaw a bit while the oven preheats. They may need an extra minute or two of baking time. Lightly touch them to check the consistency when baked - should feel firm (not hard). If it feels liquid leave them in for another 1-3 minutes. 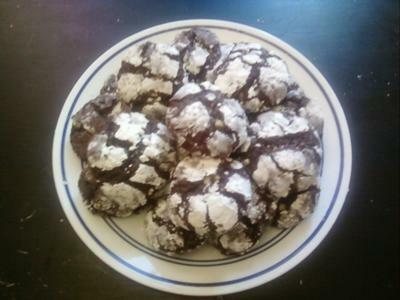 I love the snow effect of the powdered sugar and the chewiness on the inside plus the chocolate mint flavor. Great recipe. WOW THESE LOOK FANTASTIC! CAN'T WAIT TO MAKE SOME.